Since making his American night club debut in the Circus Room only a few years ago, Sergio Franchi has gained unanimous raves from spellbound critics, fellow artists and audiences from one end of the world to the other. Now in the excellence of his maturity, Franchi has catapulted into the entertainment scene in an explosion of television, night clubs and RCA Victor recording performances. 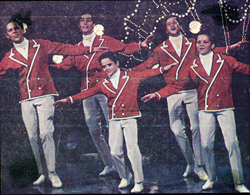 The Osmond Brothers, five extremely talented youngsters whose barbershop singing and accomplished dancing have taken the American entertainment public in its grasp, appear with Franchi in a reprise Circus Room engagement. Their multi-talents continue to amaze and delight audiences. Auditioning and landing a spot for the Andy Williams TV show back in 1962, the Osmonds (Alan, Wayne, Merrill, Jay, and little Donny) have made reality of earlier dreams of success. Currently, in addition to playing many of the top niteries from coast to coast, The Osmond Brothers have branched out into their own recording industry, starred in films and are being considered for their own television series.